Are you working on a new residential or commercial construction project? If so, contact Sunshine Plumbing & Gas for new construction plumbing services. We have the equipment, experience, and expertise necessary to complete your project on time and on budget. Using your drawings or ours, we can help you through the building process and make certain that your plumbing system will work effectively and efficiently. And our estimating department will be sure to get it right the first time, so there will be no surprises. Our plumbing repair company is State of Florida Licensed and Insured. We work with homeowners, property owners, and contractors to ensure that every aspect of plumbing in your new construction project is done correctly and stays on schedule. Contact us to speak with a plumber about your next project. What Does New Construction Plumbing Include? Even under the most ideal circumstances, you never want to entrust a new plumbing system to just anyone. This is especially true of complex and vast plumbing systems within a new property — foundational plumbing requires professional knowledge and service. With Sunshine Plumbing and Gas, you can rest assured that your new project is in expert hands. We provide the full scope of plumbing services required for new construction projects, including the following. Whether you require residential plumbing or commercial plumbing for a new construction project, Sunshine Plumbing and Gas is your first call. We understand that both homes and businesses require well-developed plumbing systems to provide families, employees, and clients with clean, safe water. Installing plumbing for residential properties is different from commercial properties — we have the knowledge and equipment necessary to properly install and oversee both types of projects. Drainage piping is very important because it removes excess water from your property from floods, heavy rains, and other causes of excess water. Complications to any drainage system could cause flooding and even water damage both to a brand new structure. 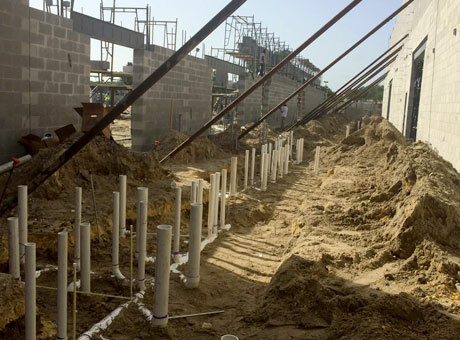 Our new construction plumbers can properly install drainage piping and are also trained to install and service French-type drains. Call us for more information about our piping services. A plumbing system is only as good as its design. A poor design layout could cause you problems in the future, require costly separate additions, or cause water supply to fail anywhere it’s needed. Plumbing experts with Sunshine Plumbing and Gas can help you design a customized plumbing plan for your new construction project that meets your property’s needs. Our plumbers are highly experienced in all types of traditional plumbing services related to showers, bathtubs, faucets, sinks, fixtures, and piping and can professionally install each component for the efficient and effective function of your new construction plumbing system. For more information or to schedule a consultation, contact us today. Backflow prevention is necessary for all plumbing systems because it protects potable water supplies from contamination or pollution caused by backflow — or wastewater that flows backward in the plumbing system when not in use. At Sunshine Plumbing and Gas, we can make sure that backflow prevention is incorporated into your new construction. Contact us for information about preventing backflow to your property’s plumbing system. An issue or crack in the piping can be very dangerous due to leaking natural and propane gas. That is why it is important to leave gas piping installations to a professional gas plumber who has the necessary skills and tools to get the job done right the first time. Our plumbers are trained and certified to perform quality and safe gas and propane services, including the installation of natural and propane gas piping, for new construction projects of all types and size. When building a new structure, conserving natural resources while leveraging the newest innovations in technology is important to our clients. Advancements in plumbing technology allow homes and businesses to become more efficient and environmentally friendly. Our plumbers can install solar water heating and PV systems that will both increase plumbing system efficiency and reduce the cost of your monthly utility bills.